With her porcelain skin, doe-like features, and legs for days, Jaime King has been a beauty crush of Us long before she starred on Hart of Dixie. The model and mother to James, 7 months, opened up to Us Weekly about the secret to her glowing complexion and long and lean stems. "I think the number one skincare routine that I follow for my body is that I drink as much water as possible," King, who always has a glass or bottle at the ready, tells Us. "It’s the number one thing to keep your skin super-hydrated, really beautiful and healthy looking." 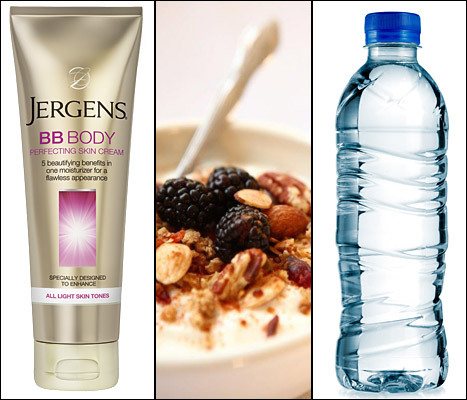 King&apos;s go-to moisturizer is Jergens BB Body Perfecting Skin Cream ($12.99, drugstores). "It firms your body and is so deliciously silky," the Pearl Harbor actress, who has been married to director Kyle Newman since 2007, raves about the drugstore find. "Especially in the summertime when you’re showing a lot of skin, you want to feel confident all over. You could use this lotion and it gives you a beautiful color and sheen and shimmer but without putting your skin at risk in the sun." Besides products she slathers on, King is mindful of what she feeds her body. The 35-year-old credits a healthy pregnancy to being able to lose baby weight quickly after giving birth in October. "There’s this company called Paleta, and they have a mommy-to-be program, which is all farm-to-table organic meals. I would have that every day, and they would deliver all the things that you need nutritionally according to your trimester as well your prenatal vitamins and things like that," King tells Us of the food delivery service. "I would also do light exercise," King says of working out to DVDs like the Ballet Beautiful series by Mary Helen Bowers and Prenatal Yoga by Shiva Rea. Once James arrived, she continued with the at-home workouts while she worked. King tells Us, "I think the key to anything is just staying active."